The problem was that the presenter spoke no German, and while I think we were all interested in the distinctions he was making, the moment he descended to cases his ignorance of the language betrayed him. Examples he would try to give of excessive literalism in Cohn’s version were often (at least in my view) quite loose paraphrases of the original. The creative transmutations he claimed to detect in Paterson were, by contrast, often bald restatements of Rilke’s German. The question and answer session was, as a result, somewhat frustrating to all. I was curious to know why he’d chosen those particular versions, and not (for example) J. B. Leishman’s or C. F. MacIntyre’s. The answer was that those were the only two translations he’d read. While I’m sure we all agreed that it should be possible to do an interesting reading of a translation in isolation from its original, this seemed too literal an approach to be really useful. The recent launch of a special translation issue of the Auckland University online poetics journal Ka Mate Ka Ora has prompted me to think a bit about its importance – or rather lack of importance – in New Zealand poetry. The issue includes translations and commentaries from Chinese (by Hilary Chung), Dutch (by Fredrika van Elburg), French (by Pam Brown and Jane Zamiro), Old French (by me), German (by Andrew Wood), Ancient Greek (by Ted Jenner), Italian (by Laurie Duggan), Latin (by Tom Bishop and Steve Willett), Polish (by Murray Edmond) Russian (by Jacob Edmond and Cilla McQueen) and Spanish (by Marty Brooks). It also includes a translation (Imitation?) into Polish of a poem by local poet Vivienne Plumb. That’s quite a range of languages: 11 in all (by my count, at least). You’ll note that there are no translations from Maori or other Oceanic or Pacific languages represented – except in the journal’s title, which references Te Rauparaha’s famous haka (as explained by Robert Sullivan in issue 1). I guess it would confirm to me that New Zealand poets have a lot of cultural and linguistic traditions to call on. Why, then, isn’t translation more important to us? Is it just one more of those things we expect to be done better overseas? I can think of a number of books which have raised the issue over recent years. Mike Johnson. The Vertical Harp: Selected Poems of Li He. Auckland: Titus Books, 2006. Kendrick Smithyman. 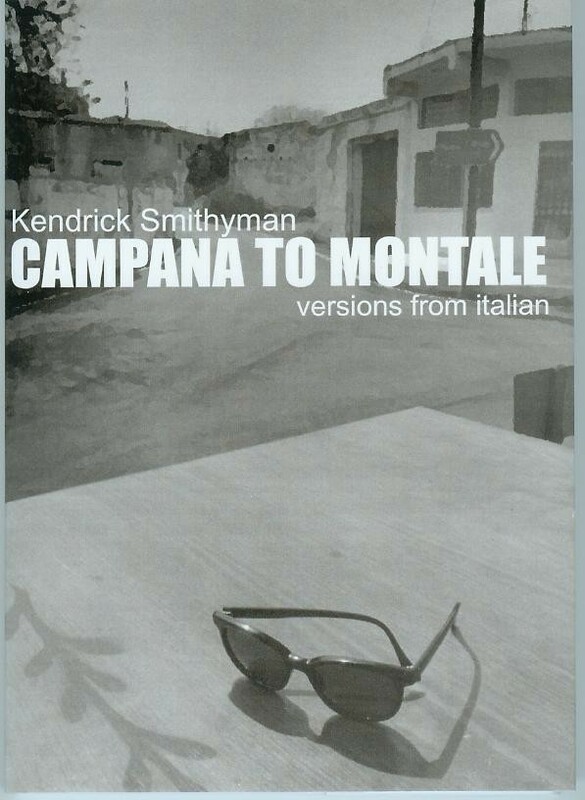 Campana to Montale: Versions from Italian. 2004. Ed. Jack Ross & Marco Sonzogni. Transference Series. Novi Ligure: Edizioni Joker, 2010. I guess, on the one hand, there’s the question of linguistic proficiency. Mike Johnson speaks no Chinese, and yet he has produced what I think would have to be called a paraphrase – rather than a metaphrase or an imitation – of the Chinese poet Li He. The same applies to Kendrick Smithyman, whose versions of the Italian modernists I edited in 2004, and was happy to see reissued, with an introduction by translation scholar Marco Sonzogni, in Italy last year. He is to consider, at the same time, the thought of his Author, and his words, and to find out the Counterpart to each in another Language ... ’Tis much like dancing on Ropes with fetter’d Legs: A man can shun a fall by using Caution, but the gracefulness of Motion is not to be expected. Europe: Revue littéraire mensuelle 931-932 (Novembre-Décembre 2006) – Écrivains de Nouvelle-Zélande / François Augiéras. Dieter Riemenschneider, ed. & trans. Wildes Licht: Poems / Gedichte aus Aotearoa Neuseeland (English-German). Kronberg: Tranzlit, 2010. It is, I think, a sad tribute to our predominantly monoglot system of education that neither of these publications has been seen as much more than a curiosity in local eyes. I guess that the individual authors feel flattered to be selected for translation, but few of us are in a position to judge how well or badly the task has been performed (very well indeed, in the case of Dieter Reimenschneider, I would hasten to add). What else? Well, it really does surprise me that more fuss has not been made by New Zealand poets over the definitive publication of the massive body of traditional Maori songs begun by Sir George Grey and completed by scholar and statesman Sir Apirana Ngata. This collection was reprinted in a revised and updated form, with new versions of previously untranslated material, by Auckland University Press, between 2004 and 2007. It’s recently been supplemented by a one-volume introduction to the entire collection. Jane McRae. Ngā Mōteatea: He Kupu Arataki / An Introduction. 1990. Trans. Heni Jacob. Polynesian Society Memoir, 56. Auckland: Auckland University Press, 2011. Apirana Ngata. Ngā Mōteatea: He Maramara Rere nō ngā Waka Maha He Mea Kohikohi / The Songs: Scattered Pieces from Many Canoe Areas: Part 1. 1959. Ed. Pei Te Hurinui Jones. Auckland: Auckland University Press, 2004. Apirana Ngata. Ngā Mōteatea: He Maramara Rere nō ngā Waka Maha He Mea Kohikohi / The Songs: Scattered Pieces from Many Canoe Areas: Part 2. 1961. Ed. Pei Te Hurinui Jones. Auckland: Auckland University Press, 2005. Apirana Ngata. Ngā Mōteatea: He Maramara Rere nō ngā Waka Maha He Mea Kohikohi / The Songs: Scattered Pieces from Many Canoe Areas: Part 3. 1970. Ed. Pei Te Hurinui Jones. Auckland: Auckland University Press, 2006. Apirana Ngata. Ngā Mōteatea: He Maramara Rere nō ngā Waka Maha He Mea Kohikohi / The Songs: Scattered Pieces from Many Canoe Areas: Part 4. 1990. Trans. Hirini Moko Reed. Auckland: Auckland University Press, 2007. It’s true that some of the older translations in these volumes are fairly stilted. The fact that they’ve been republished with new recordings, on CD, of the traditional chants, should in itself be fascinating to us. It’s as if a New Zealand Iliad or Kalevala were to come out from the press without any particular fanfare. Were we all too busy arguing over the latest slim volume of clipped, ironic lyrics? This new issue of Ka Mate Ka Ora is an excellent start, I feel, but New Zealand poets (and publishers) have to work a bit harder to jolt themselves out of their “English-is-the-one-world-language” rut, I feel. Why should translation projects be such a drug on the market? What does Dryden say? Both Mike Johnson and Kendrick Smithyman seem to have discovered new aspects of themselves by looking through the eyes of foreign language poets. It’s simply not true to the reality of modern New Zealand for our writers to imply that we only speak and understand one language here.